Jul 29, 2017-Lain Singh Bangdel was best known for being the catalyst that brought Modernism into Nepali art. His daughter, Dina Bangdel, who passed away on t July 25 in Richmond (USA), had carried his legacy forward to astonishing results. At the time of her death, Bangdel was just 52 and yet she was already recognised as one of the world’s most prominent experts in traditional Himalayan Art. More importantly, she was among a handful of people performing the extraordinary task of informing the global art mechanism of Nepal’s contemporary art practices. The whole of South Asia (including Tibet) was her field, but Nepal, especially Kathmandu Valley, remained her life-long focus. I am yet to come across a scholar from this country with as much commitment to Nepal’s cause in every aspect of the arts. Bangdel (1965-2017) rose to her current status through years of hard work and discerning accumulation of knowledge and expertise. She trained in USA with some of the best in art history, receiving her BA in History of Art at Bryn Mawr College in 1989 and her masters in South Asian Studies from University of Wisconsin-Madison in 1991. She went on to teach in the art history departments of Ohio Wesleyan University, the Western Michigan University, the Ohio State University, the Virginia Commonwealth University and was currently the Director of Program at the Virginia Commonwealth University’s campus in Doha. I had heard her say numerous times that she elected to relocate to Doha so that she could make quick trips to Kathmandu throughout the year and be active in promoting Nepali arts to the world. Her PhD dissertation, which she did with the renowned Himalayan and Buddhist studies experts John C Huntington and Susan L Huntington at the Ohio State University in 1999, was seminal in its content. Called Manifesting the Mandala: A Study of the Core Iconographic Program of Newar Buddhist Monasteries in Nepal, the title of her dissertation speaks for itself and has since been hailed as a rare unveiling of Newar Buddhism for common understanding. More importantly, Bangdel had articulated arguments to rid Newar Buddhism of the label that it was a mixed practice. ‘Newar Buddhism remains the last remaining legacy of Indian Buddhism that is practiced within an actively South Asian cultural context,’ reads the introduction to her dissertation, and she goes on to explain how this particular strain of Buddhism not only retains the chief tenets and goals of the soteriological practice, but intelligently adapts itself to the official religious discourse of the times to survive historically. And even more importantly, she drew attention to the extraordinary flowering of culture around the practice, over centuries and to this day, that gives Newar art its unparalleled position in South Asia. Islam, which she co-edited. I remember her strained but joyous face as she sat in our living room with her husband, and led us through the many facets of Nepal’s traditional, modern and contemporary art. I listened spellbound. The evening ended with her husband, Bibhakar Shakya, telling us about how he had first walked into the waiting room of Ohio State University, and realised that he had found his soulmate as soon as his eyes fell on her. In a way she took me under her wing, letting me accompany her on some of the studio visits she made whenever she visited Kathmandu. And thus my introduction to so many of the premier, senior artists of this country was fast-tracked. What I found amazing was the ease with which she discoursed with ‘Paubha’ artists on the intricacies and varying schools of their individual practices, while talking modernist history with the Nepali modern stalwarts, while inspiring and tweaking the younger generation of ‘contemporaries’ with her vast first-hand knowledge of the current, global art scene. Dina was a turbo-charger that fuelled, inspired and drove all generations of artists in Nepal living in contemporaneity, no matter how diverse their practice, over the last decade or so. 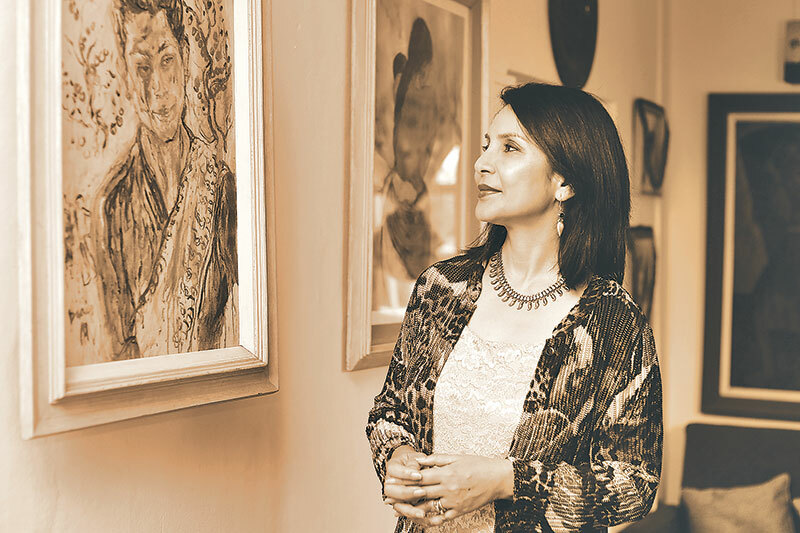 In association with the Nepal Art Council, which her father headed for long stretches of time and during which he pushed Nepal into the Modernist scene, Dina led Nepal’s first significant forays into the South Asian art fairs scene. She handpicked artists for the India Art Fair contingents and supported them in every possible way, especially with advice that came from her globe-hopping exposure. Our paths had diverged of late, but I could not but appreciate the extraordinary collateral that she put up and curated for the recently held Kathmandu Triennale. I hear that she was already between surgeries when she pulled it off, having brought together an extraordinary body of work from Nepali and Qatar-based artists on the theme of migration, labour and identity. Incidentally, every one of the artists from Nepal that are making forays into the international art world today, were incubated by her in one way or another. Dina was a rare scholar who could, in equal stride, be a PhD advisor to students that delved into the intricacies of a Dipankara Buddha or an Anish Kapoor. Not many, even in our globalised world, are capable of such feats of straddling such diverse boats. She forged pathways for Nepali scholarship and arts practices, which undoubtedly will only be appreciated much later. Identification of heritage pieces scattered all across the world’s many museums and private collections, and the need for restitution of the same, especially from private collections, was a passion she shared with her father. This is evident from the book she co-authored with him, Inventory of Stone Sculptures of Kathmandu Valley (1997) that now acts as a handbook for such efforts. It was just yesterday that I heard that her dream was slowly being realised—the Guimet Museum (better known as Musée national des arts asiatiques) of Paris, with the largest collection of Asiatic art lying outside of Asia, is in the process of restoring, exhibiting and finally returning a selection of such works with her facilitation. For Nepal, the event will be (and am hoping that it will indeed materialise in her absence) of unprecedented magnitude. She produced numerous books, articles, presentations during her career; curated path-breaking shows, including the acclaimed Circle of Bliss; given talks that helped reshape the world’s perception of Nepal’s traditional, modern and contemporary art practices. Everything she touched, everyone she met was marked for life by her intense, effervescent personality. Of all my memories of her, when I think back, what I remember most intensely is the image of her in a lime-green jacket, pushing effortlessly through the crowd at the Doha airport’s arrival section, pushing aside people double her side, looking for me. Then she saw me and her face, anxious to the point of desperation for she had thought I had gotten lost on arrival, broke into a smile that lit up everything around us. She knew what it felt like to be alone on foreign soil. She had lived it herself. She was a person, who got invested in everything she touched, everyone she met but never once did she forget her location as a Nepali. Her ambition for her home country, especially in the arts, was limitless and she would protect its concerns and rights like a tigress. But she was also the most soft-spoken, kind, gentle person I have met. I do hope her country will not fail her, especially the art fraternity. For not once has she failed them, except in her passing.